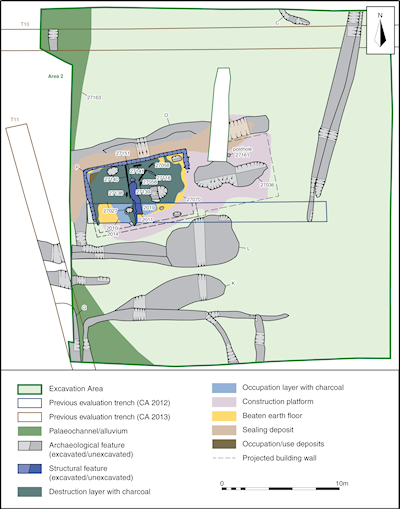 The excavation in Area 2 targeted the medieval building identified during the preceding archaeological investigations (features identified in the 2012 evaluation are included in the description below) (Figure 4). The natural gravel and sand substrate was overlain at the western side of the area by an alluvial deposit, 27163. This deposit was cut by Ditch O and so is likely to have pre-dated the medieval occupation. The central part of the area contained a number of features relating to the medieval building, along with ditches and gullies associated with agricultural enclosures, boundaries and drainage features. The building had been constructed on a construction platform (27071) formed of redeposited natural gravel and a terrace cut into the north-west/south-east slope on this part of the site. On its north and west sides the platform was surrounded by wide, shallow Ditch O; it is likely that this ditch was contemporary with the construction of the building and served to channel water away from the structure. Ditch O appeared to have been revetted with rubble in places along its southern side, probably to prevent subsidence of the northern edge of the construction platform. Ditch O contained natural silt fills and dumped deposits, the latter perhaps associated with levelling following disuse of the building. 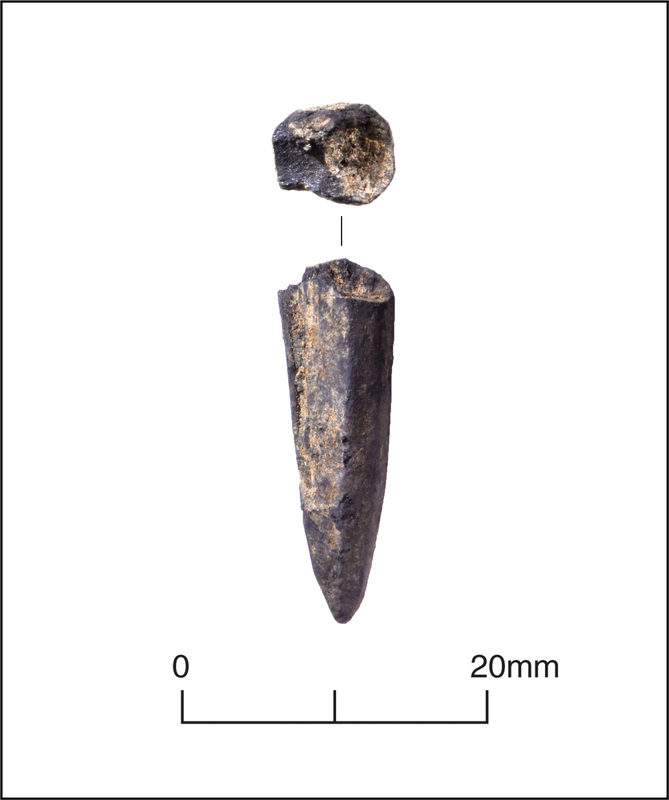 Pottery of 13th to 14th-century date and an iron nail were recovered from the earlier silty fill. The northern part of Ditch O had been partially recut as ditch 27088, which contained predominantly rubble. The ditch was sealed by a post-abandonment infill that also sealed parts of the structure in this area (such as beam-slot P, below). The construction platform was cut by a number of features, the most notable being beam-slot P enclosing about three-fifths of the platform at its western end. This was a shallow, narrow gully with steep sides and a flat base, representing parts of three sides of a rectangular structure that was at least 9m long and 4.5m wide; a sherd of 12th to 14th-century pottery was recovered from the beam-slot's only fill. At less than 0.5m wide, the beam-slot appeared not to have been a foundation trench for a stone footing. 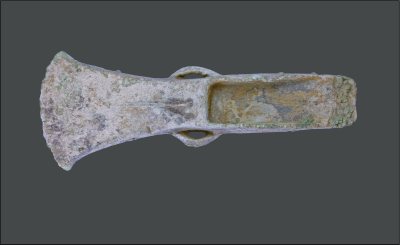 The eastern side of the beam-slot was notably shorter than the western side, suggesting an entrance to the east. 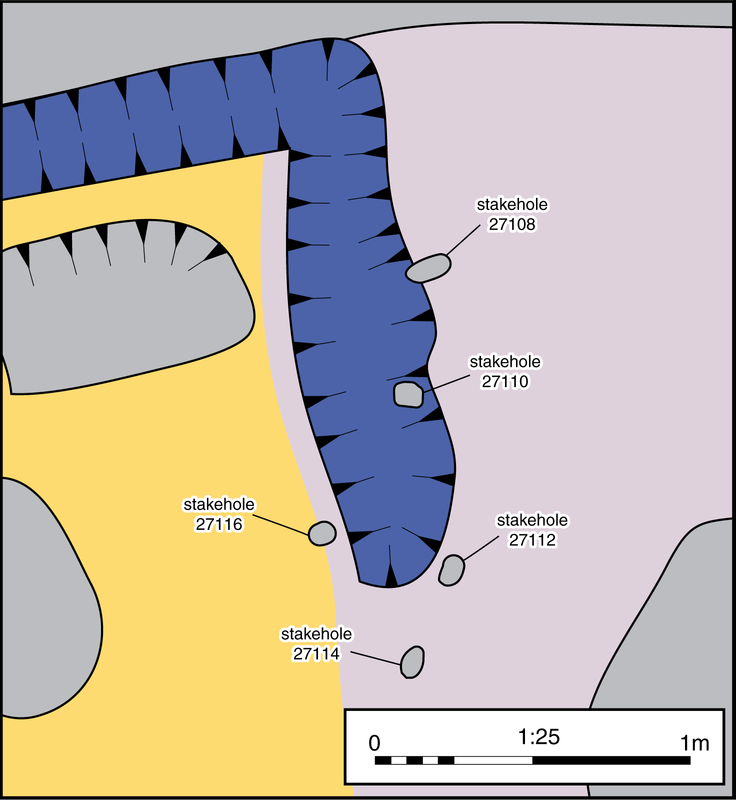 Five stakeholes were located around the south terminal of the eastern side of beam-slot P (Figure 4, inset), possibly the remains of a wattle panel or other structure. It is likely that the south-eastern wall of the structure was constructed on a plinth at the same height as the base of the beam-slot, no evidence for which survived. 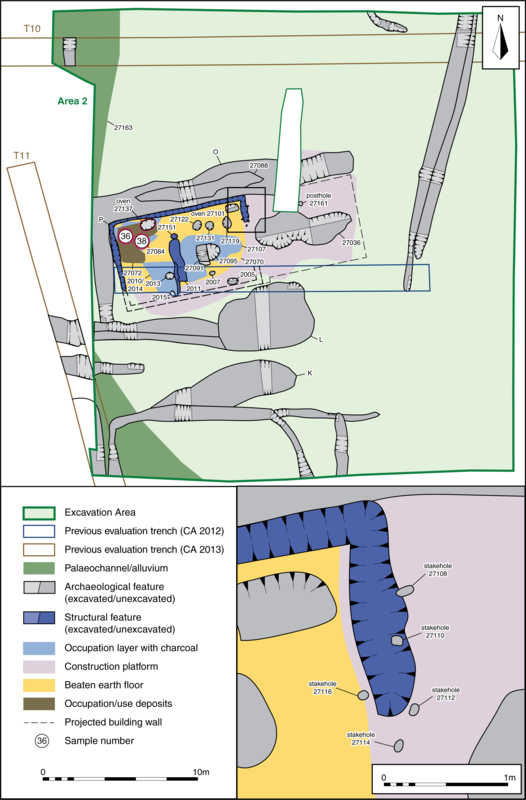 The area enclosed by the beam-slot was divided into two unequal spaces, described here as the main room and the western room, by a rudimentary and partly dismantled or 'robbed' stone wall (2011). This was laid directly onto beaten earth floor 27070, and therefore was not a primary feature. It is likely that this wall was an internal division or perhaps a foundation for a bench as it was poorly built, with no surviving bonding material, and seemed unsuitable for supporting a roof. The wall was aligned with posthole 27151, located immediately to the north, which was at least partly sealed by the floor and was perhaps a structural support and a door post. No other internal features appeared to have been structural. The two other postholes in this area (2013 and 2015) were not aligned with the wall. The beaten earth floor (27070) lay directly on the construction platform within the space enclosed by beam-slot P (Figure 4). This floor was overlain by a number of overlapping sandy occupation deposits with charcoal inclusions (2010/2014, 27072, 27084 and 2019/27107), which had accumulated during the use of the structure. 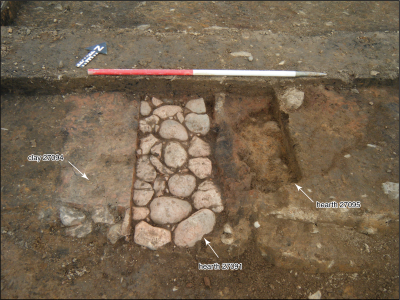 The floor was also cut by several features including hearths (27091, 27095 [Figure 5]), two ovens (27101 [Figure 6] and 27137) and a number of pits. The two hearths were adjoining and contemporary with each other, constructed in shallow pits. 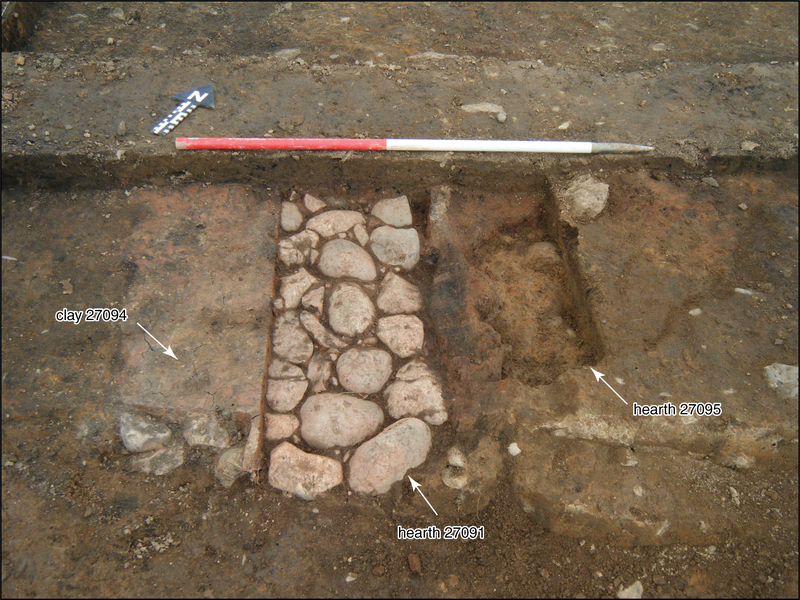 Hearth 27091 was rectangular and solidly constructed, with a layer of cobbles overlain by a surface of compacted pink clay, whereas hearth 27095 was sub-circular and had an upper fill of heat-affected sand. A charcoal-rich spread (27107) surrounded the hearths, partially overlying the surface of hearth 27091 on its west side, and butting the internal wall 2011. This layer probably derived from usage of the hearths. Oven 27101 (Figure 6), in the corner of the main room, was rectangular in shape, was 0.78m long, 0.38m wide and 0.17m deep, and had notably scorched sides. Its basal fill (Sample 33) mostly comprised charcoal, identified as a mixture of beech, alder/hazel, oak, ash and hawthorn-type (see Data Tables), while the later fills included sandy silt with fragments of burnt clay, possibly representing a collapsed superstructure. There was nothing to suggest a specific use for this oven. 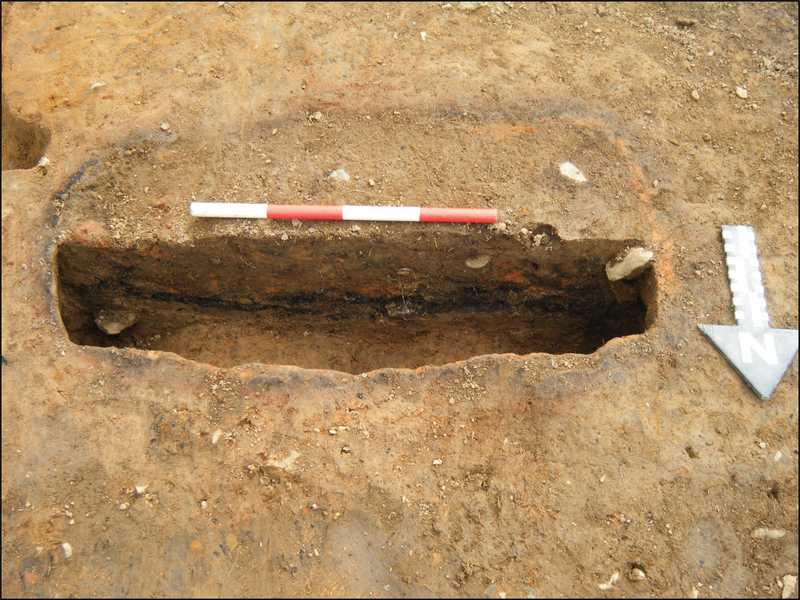 Located in the western room, oval oven 27137 was 0.96m long, 0.65m wide and 0.23m deep. 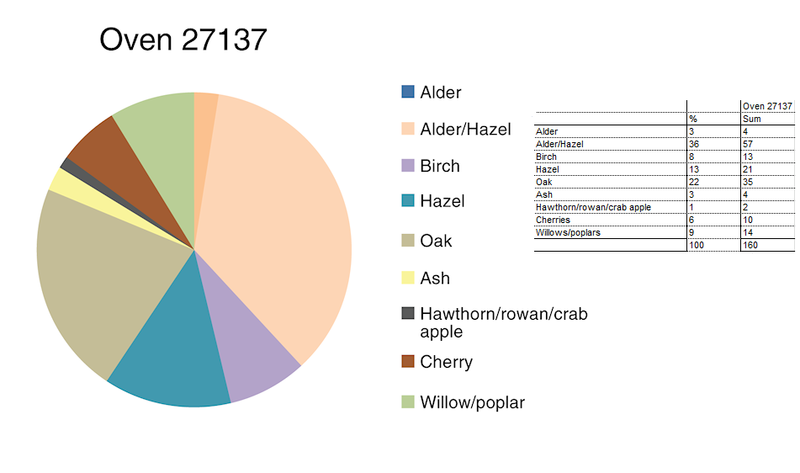 Its primary fill was mostly charcoal of alder/hazel, oak and ash (Sample 46, see Data Tables). Its middle fill contained many iron scraps, but there was no indication that the oven was used for ironworking; it is possible that they were broken fittings, including nails, in timber used as fuel. The oven's last fill contained three sherds of 13th to 14th-century pottery. There was less scorching of the sides than in oven 27101, suggesting less intense burning. A charcoal-rich deposit (27084) partly overlay the oven and was likely associated with the use of the building, although clearly later than the oven. 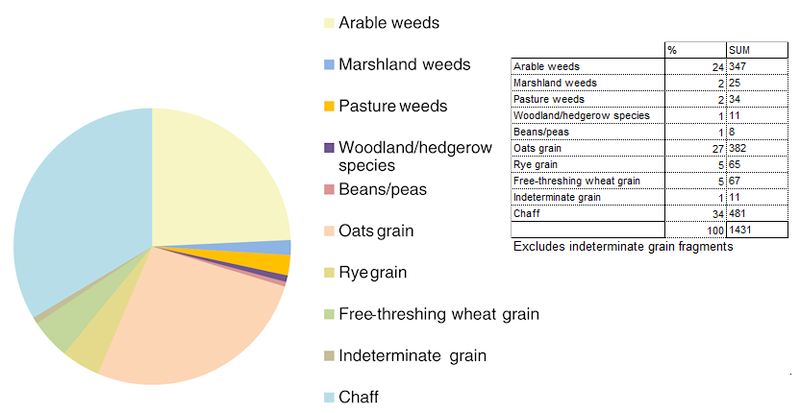 It contained a range of wood species such as alder/hazel, birch, oak, ash, cherry and willow, as well as oats. This deposit was itself overlain by a probable occupation deposit (27072), which had built up against the walls of the north-western corner of the structure. Deposits 27084 and 27072 contained many copper-alloy fragments, suggesting the repair of metal vessels in this corner of the building. They also contained two wooden pegs of unknown function (Sample 36, Sample 38). There were a number of pits within the structure, several of which cut floor surface 27070 (2007, 27119, 27122 and 27131) and were sealed by later burnt layers. Their function was uncertain although they may have been structural features. Some 12th to 14th-century pottery was found in pits 27119 and 27131, although pit 2007 was not sealed by burnt layers and may have been later. Pit 2005, on the structure's southern side, was probably also internal but it did not have a surviving relationship with floor 27070, almost certainly a result of horizontal truncation in this area. Deposit 2010/2014 comprised burnt black and orange sand with frequent charcoal inclusions, representing an amalgam of occupation layers and the final destruction layer, as no distinct upper burnt layers (corresponding with layer 27027) were recognised. 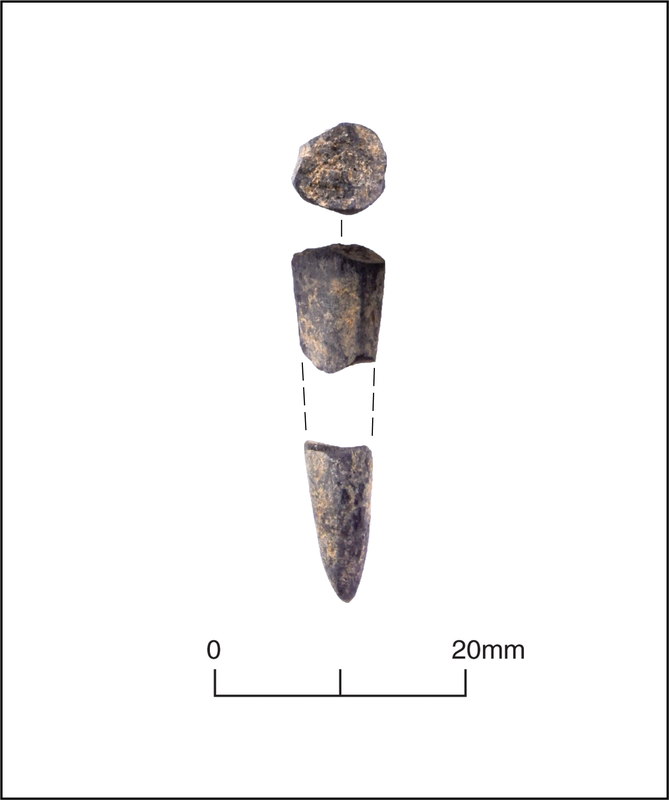 A Middle Bronze Age double-looped bronze palstave (Figure 7), a probable medieval iron axe-head, an iron nail, and mid-13th to 14th-century pottery sherds were recovered from this deposit. It was cut by postholes 2013 and 2015. At the eastern end, the continuation of Ditch O and the levelling platform suggests that there was another room or attached building, for which no structural remains survived. This contained a large, irregular pit (27036), up to 0.35m deep, with three fills, the earliest containing a sherd of 13th to 14th-century pottery. 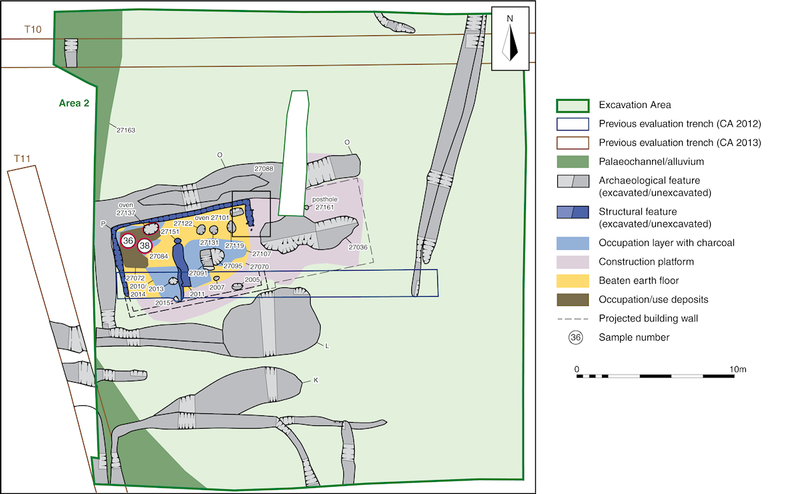 The middle fill (27038) was a charred deposit (perhaps derived from the conflagration of the building, described below) containing many cereal grains, especially oats, and oak, willow and hazel/alder charcoal (see Data Tables; Sample 5). In section, a possible localised occupation deposit (27054) was identified to the north of the pit, overlying the levelling platform. This deposit was cut by a posthole (27161). 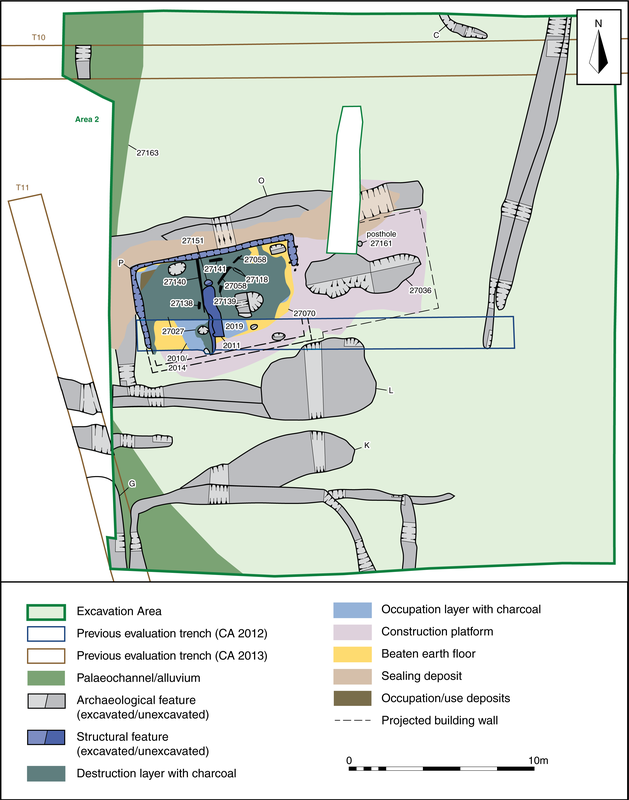 Most features and deposits in the western and main rooms were covered by an extensive charcoal-rich layer (27027), containing large burnt timbers and timber fragments (27058, 27118, 27138, 27139, 27140, 27141; Figure 8). This layer represents a catastrophic conflagration, the burnt timbers being parts of the collapsed roof. Finds from layer 27027 included copper-alloy objects and a cushion-stone, probably used in metalworking, and, most notably, large quantities of burnt cereals and legumes, predominantly oats. A grid was imposed over layer 27027, and soil samples taken from across the grid have allowed the distribution of these remains to be plotted (see section 2.4), demonstrating distinctive concentrations of material. In particular, the concentration of cereals and legumes in the western room may reflect foods that were stored here, or perhaps in an attic that collapsed into the room below during the fire. Other burnt botanical remains may be the remnants of containers such as baskets, the wall structure and roof thatching. A number of ditches, gullies and hollows lay to the south, east and north-east of the medieval building, predominantly aligned east–west and north–south. These probably relate to agricultural enclosures, boundaries and drainage features, dug to direct water downslope to the east. Two broad, shallow hollows (K and L), located to the south of the building, may reflect trampling and erosion of the ground near the building's main entrance. Several of these features contained 12th to 14th-century pottery.